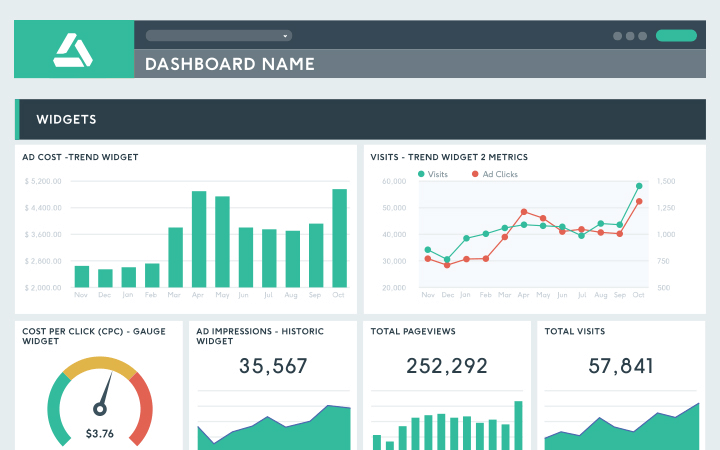 Online marketing dashboards are the best way to have all your KPIs into one single up-to-date dashboard. Your data is available 24/7 and contains all the relevant metrics for your website performance, PPC campaigns, social media, and more. With an online marketing dashboard, you can consult your latest marketing data in a matter of seconds, wherever you go, whenever you need. The data is always up-to-date and easily accessible. May it be traffic, sessions, conversions, likes, clicks, bounce rate, page views, or visitors, you can track all your marketing data in one simple-to-use online marketing dashboard. Printed dashboards are so 1990; see your data update itself automatically with an online, responsive dashboard. Sharing your insights and data has never been easier. SEO, PPC, email marketing, Google Analytics, social media, or ecommerce dashboards; create them all with our easy-to-use dashboard templates and preset widgets. You aren’t only working with one digital platform, right? Your everyday tools are probably a combination of Facebook Ads, Google Analytics, Moz, Twitter, SEMrush and other marketing platforms. That’s exactly why DashThis is connected to such varied integrations… to make your time spent reporting shorter. An online marketing dashboard is an incredibly valuable asset when it comes to showing your clients the results of your hard work. However, we know that it can be a time-consuming process when it's done one source at a time, one dashboard at a time. That’s exactly the reason why so many agencies and marketers have trusted us to simplify their lives: so that they can use the extra time to create more value for their clients! Traffic, Time on Site, CTR, Conversion Path, Bounce Rate… Your clients’ websites undoubtedly involve a whole lot of data you need to constantly keep track of. With a Google Analytics dashboard template, gather all your clients’ website data in a single, nice-looking Google Analytics online dashboard and start reporting in no time! Our online marketing dashboard software offers a ton of features, always with user-friendliness in mind: simple customization, intuitive design, preset widgets, and more. You also get your own dedicated account manager no matter the plan you choose. Oh, and no coding or IT specialist required. Not bad, huh? Our pricing is pretty straightforward: you pay according to the number of dashboards you need. The best part? No matter what plan you choose, every single feature we have is available to you. All the preset templates, integrations, sharing options, the help of our account managers, and so much more. Want a fully custom online marketing dashboard that looks like your brand? Our designers would be happy to create one for you! Save on a custom URL and design with a white label bundle that includes both! An online marketing dashboard just the way you want! Read our blog for more online marketing related content!